Is Gadolinium Safe for Breast Cancer MRIs? As gadolinium flows through your bloodstream and enters the magnetic field, its temperature increases slightly; you won’t feel this effect because the amount of the element is so small. The signals created by the passing gadolinium are picked up by special radio equipment inside the MRI machine. Those signals are sent to a computer, which creates images of the breast tissue. The presence of the gadolinium in the veins highlights the circulation inside your breast and helps create a high-contrast image. Gadolinium will cool off as it exits the magnetic field and will be cleared from your system by your kidneys. MRIs are typically safer than other diagnostic procedures. They do not use ionizing radiation that has been linked to cancer. However, recent research has suggested that there are some risks involved with gadolinium that were not previously known. In 2014, a series of three studies were completed that identified a potential link between gadolinium and brain abnormalities. 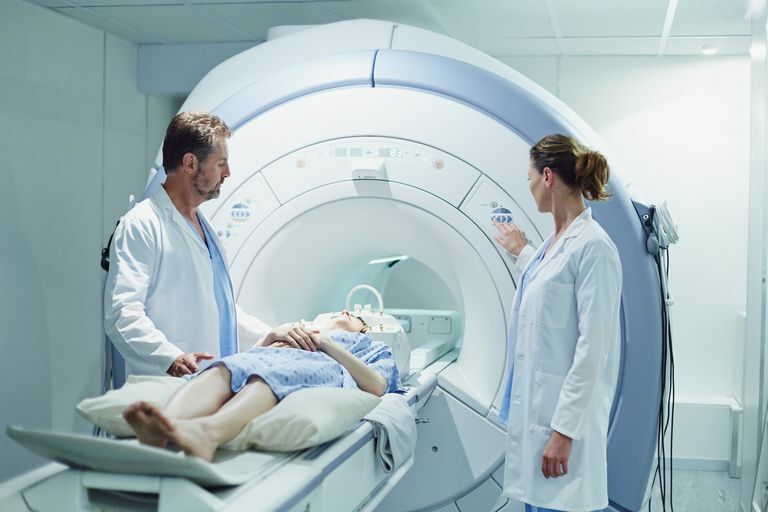 While gadolinium was believed to be completely eliminated from the body after an MRI, the researchers found that the gadolinium may not be eliminated right away and can instead linger in the body, affecting tissue. The presence of gadolinium can lead to some disorders like multiple sclerosis (MS). While these results were only shown in these preliminary studies, it is a factor to consider when beginning your treatments and should be discussed with your doctor. In 2015, the FDA issued a follow-up on the brain deposits associated with gadolinium. It appears that this was of more concern if a person were to have four or more contrast MRIs using these agents. Even with this, however, it's not known whether it could be harmful. Gadolinium may also be retained in the skin and in the bones. There are no known risks from exposure to the radio waves used during an MRI session. In December 2006, a Public Health Advisory was issued by the FDA about a rare skin disorder which can be caused by gadolinium. In some cases, gadolinium can cause nephrogenic systemic fibrosis or nephrogenic fibrosing dermopathy (NSF/NFD). NSF/NFD may occur two days to 18 months after exposure to gadolinium. It was reported in patients with kidney failure and acidosis. NSF is a painful skin disease associated with thickening of the skin. It is associated with joint pain and reduced range of motion beginning weeks to months after the procedure is done. These side effects are generally rare and MRIs using gadolinium agents are still frequently used and recommended to determine the presence and growth of cancer. Breast MRIs use an extremely low dose of gadolinium, so doctors believe there is little risk of overdose or side effects. A clear MRI scan, due to the use of gadolinium, is of great benefit for a woman at high risk for breast cancer. It can determine cancer in early stages, allowing for early intervention and more effective treatments. There have been approximately 200 reports of NSF/NFD reported worldwide, in patients who were having a Magnetic Resonance Angiogram (MRA) test. An MRA uses up to three times more gadolinium than a breast MRI. Other than the very uncommon cases of NSF/NFD, it's uncertain how harmful gadolinium may be. We know that it builds up in the brain, skin, and bones, but it appears that those who have several (greater than four) procedures using the agent are at most risk. Still, we don't know what clinical significance this has at this time, and the FDA is continuing to monitor and observe this over time. Talk to your doctor if you have any concerns about diagnostic procedures and treatments. She can help you understand the risks and benefits of each option. Be your own advocate. Ask your doctor if there is an alternative test which you could have done that would provide similar information. That said, nearly any medical procedure brings the potential risk of complications, and MRI studies, since they do not involve ionizing radiation, may be safer overall than some other alternatives.